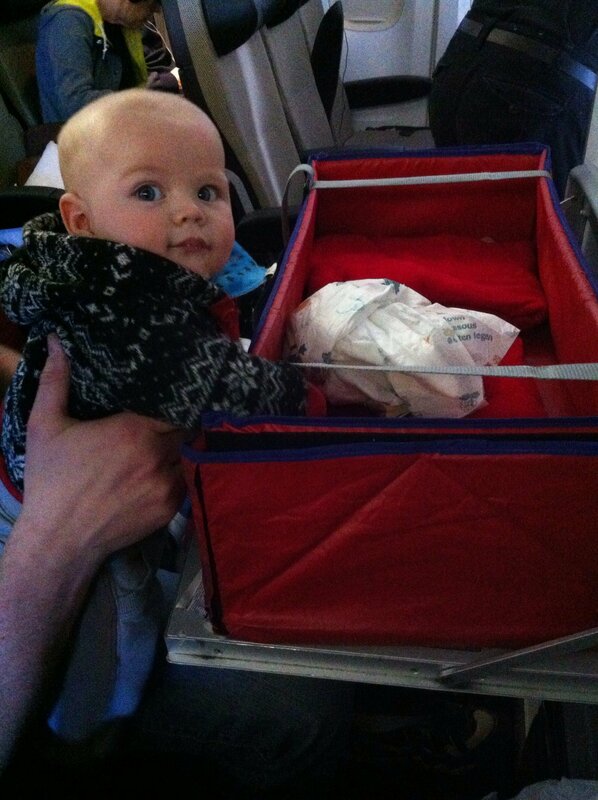 When James was a five month old baby, we took him on his first ever flight to Florida. By now (he is 3 and has taken well over 30 flights), we are pretty experienced at travelling on planes with children, and took Noah to Chicago when he was 8 weeks old. I thought it might help one or two parents to share my tips for flying with a baby. Five months is actually quite a good age, because the baby is not yet crawling, and still doing a fair amount of regular sleeping. Mostly you don’t have to worry about feeding them food, because the recommendation is to start food after six months, and so breast or bottle will help with little ears on the plane. We travelled with Virgin Atlantic and they couldn’t have been more helpful towards us, not that we really needed anything as the humming of the engines kept him so calm through the whole flight. If you are flying with a baby, it is worth ordering a sky cot in advance, if you can. It gives you a space to put the baby while you’re eating, or when they’re sleeping. If your child is borderline for the weight limit, do still book the space because you get extra legroom, which is always helpful. You might not need the bassinet, but you can use the shelf. It’s so handy to have a space to get the baby off your knee (for example while you’re eating)! Sky cots are usually free, so it is worth asking. Spare outfits – for everybody! I cannot emphasise this enough – take more spare clothes on the plane with you than you think you will need. You just never know when there will be an exploding nappy, or worse…! One memorable flight we went through five changes for James and two each for Rob and me – and we still ended up wearing whatever was least messy, because James had been sick repeatedly for the whole flight. I even had to change my bra, so thank goodness for not being shy about taking clothes in the carry-on! Take what you need, but you can always buy more there. Flying long haul we took half a pack of nappies in the change bag, and decided that we’d buy more while we were in the States – they have the same brands as here, and more – just watch the sizes; they are not the same as the UK. I think if you’re breastfeeding then pre-six months is the easiest time to fly with a baby. Take-off and landing can hurt their ears so that’s a good time to offer a feed or dummy (if you use one) as the sucking/swallowing helps to alleviate ear pain. On the way back James actually sucked on the tail of a toy cow, so hey! Whatever works! What else to pack to take on the plane when flying with a baby? 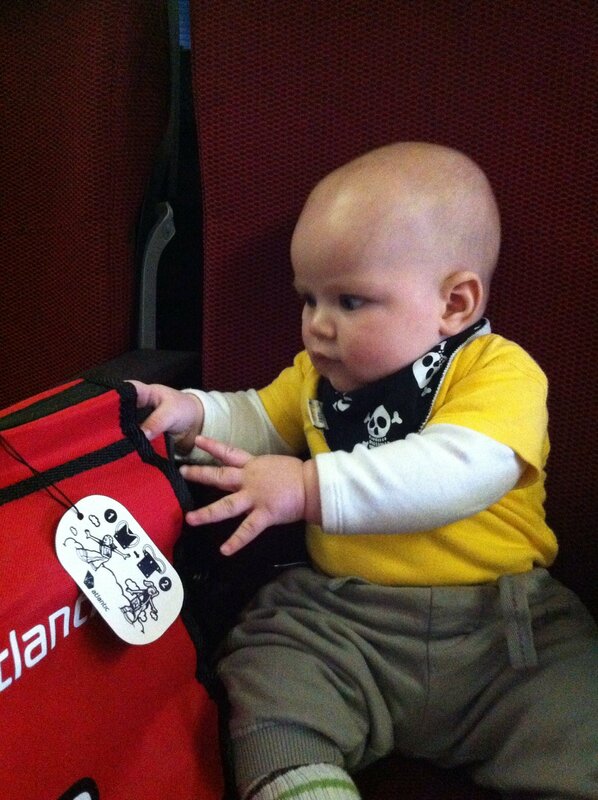 A few toys, Calpol sachets, and teething powders if you use those, a comforter and a sling for through the airport. Babies this age are pretty simple creatures; happy to be with their parents. Babies are easily amused with interesting things like the seatbelt, or a zip on a bag. Pushchairs are great extra FREE baggage allowance! When we went to Florida for the month we did not take a pushchair. However, since then we’ve discovered that pushchairs aren’t weighed and don’t count as part of your baggage allowance. You check them in at the oversized baggage counter, after you’ve checked in your other suitcases. It is a good idea to get a buggy bag and put all your nappies, wipes, sleeping bags, and so on into that to save your luggage allowance! If you do this, you really need to do your best to stabilise the contents of the bag. We wrap the nappies, etc on to the pushchair frame using clingfilm. It all helps to protect your expensive pushchair, too. And very importantly, don’t let having a baby put you off travelling and flying with a baby. Babies are portable and want to be with their families, wherever in the world you are going to!